The Blackberry Playbook, which was announced months back, is finally available for purchase. The Playbook has been priced at $499 for the 16 GB version, $599 for the 32 GB version and $699 for the 64 GB version, just like the iPad 2. The Blackberry Playbook was made available to many reviewers a week back, and most of them didn’t like it very much. Though it is a very good attempt, it just can’t beat the iPad 2 yet. The iPad 2 is not only bigger, but also offers about 65,000 apps, while the Playbook offers almost none. Without a native calendar, email client or the promised Android app support, currently, it’s not a very good option. However, with some updates and more apps, it should offer a good alternative to the iPad 2. The user interface is very good and fluid, and it excels at multi-tasking. 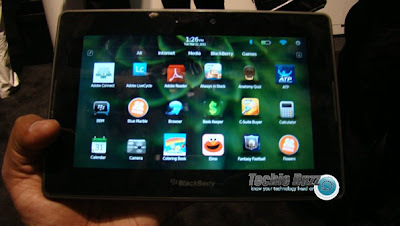 Here’s a hands-on video of the Blackberry Playbook at CTIA 2011. The Blackberry Playbook come with a 7 inch capacitive touchscreen display with a resolution of 1024 x 600 pixels. It has a 1 GHz dual core processor and 1 GB RAM, and comes with a 5 MP primary camera which can record 1080p video and a 3 MP front-facing camera for video calls. It offers Bluetooth, Wi-Fi and GPS support as well. Now only if it had a lot of great apps, it would be worth the price.